Devine Varsity Tennis Team came away with an impressive 2nd place this weekend at the Edison Tennis Tournament. Our kids played with a lot of patience and perseverance, never giving up till the end. Some had to play very skilled tennis players and lost, but never quit fighting. Four of our JV players teamed up to play this week since we are missing so many to basketball. 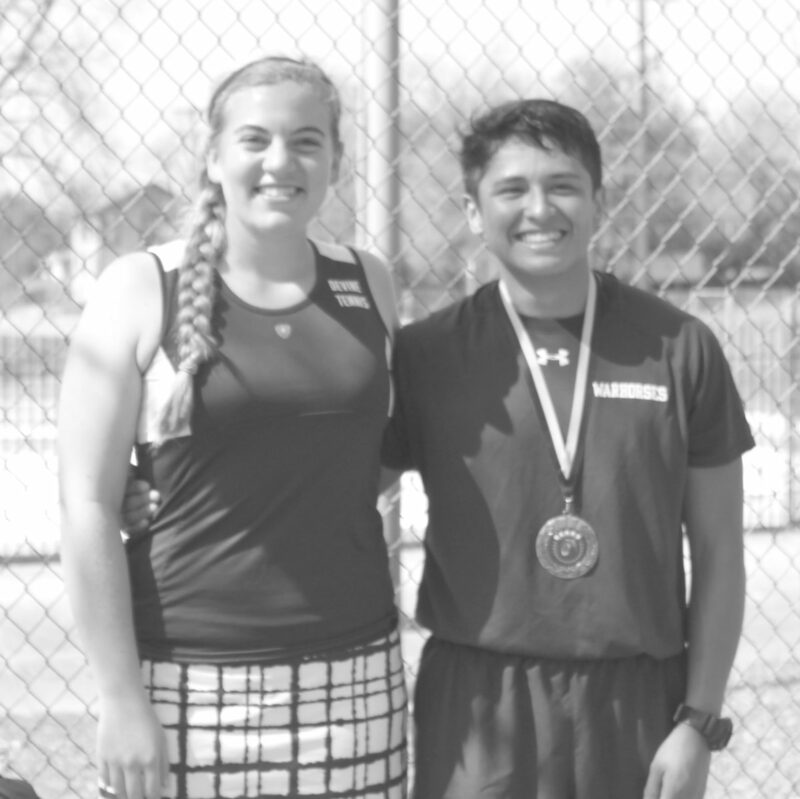 Malvin Flores and Elizabeth Alvarado played doubles and lost against Pena/Bolguin of Edsion (3-6, 1-6) and Rangel/Martinez of Uvalde and lost (0-8). Norbert Gogan and Clayton Brown played boys doubles losing their first match to Cardona/Garcia of Memorial (3-6, 1-6), then beating Ortiz/Gomez of Miller (8-0). The next match they lost to Joshi/Cordeway of Seguin (0-8). Arabians Lydia Zapata and Scarlett Smith won Consolation in Girl’s Doubles. These girls lost their first match to Tivari/Verhaeghe of McNeil High School (0-6, 0-6). This very skilled team from the Round Rock area won 1st place. Zapata/Smith won the next three matches against Bennett/Sydney of Jourdanton (8-1), Quigano/Rodriguez of Uvalde (8-2), and a tough Rodriguez/Faulkner pair from Wagner (8-2). Abbie Capps and Tristan Woods played in the mixed doubles bracket this week. They won their first two matches quite easily beating the McNeil team of Nelson/Barnes (6-2, 6-0) and Gonzales/MacHorro from Bowie (6-0, 6-1). In their semi-finals match they lost to a very experienced Laredo-Nixon team of Perusquia/Flood. They came back, split sets and lost in a close tie breaker (4-6, 6-2, 9-11). Chloe Serafin played two tough matches. Both of her opponents were very skilled players, Serafin lost to T. Lutfak of Huttowith a tie breaker in the second set (4-6, 6-6 (8-10)) and then lost to A. Petri of Incarnate Word High School (1-8). Petri ended up winning the Consolation bracket. Warhorses Ralph Rios and Mason Zenon teamed up this week for Boys Doubles. They won their first two matches against Guerra/Guerra of Uvalde (6-0, 6-3), Sanchez/Lopez of Bowie (6-3, 6-3). At the semi-finals match they lost to Tran/Dorf of McNeil (2-6, 1-6). Both Rios and Zenon did a great job considering they have never played together before. Lindsey Spannagel had a successful weekend making it all the way to the semi-finals match in Girls Singles, which was quite impressive since there were 32 entries in this division. Spannagel won three matches to make it to the semi-finals. She beat C. Nguyen of McNeil (6-2, 6-2), A. Long of Yoakum (6-2, 6-0), and C. Olivares of Laredo Nixon (6-4, 6-3). Saturday morning Spannagel lost her semi-finals match to A. Osherow of Incarnate Word High School (0-6, 0-6). Osherow went on to win 1st place. Senior Jaime Garza came away with a 1st place medal winning 5 matches in Boys Singles, which also had 32 entries. He beat A.Gonzales from Irvin (6-2, 6-3), P. Gara from McNeil (6-2, 6-2), and finally W. Salinas from Irvin (6-2, 6-2). Garza then played a very tough match against J. Hinojosa from Lockhart. Garza lost the first set 3-6, came back and won the second set 7-5. His patience and determination payed off as he won the match with a 10-5 tie breaker. After a short break, Garza played another Lockhart opponent for the 1st place title. Garza proved to be too much for A. Dorado, winning in 2 sets (6-3, 6-4). Awesome job this weekend. The whole team stepped up and played hard to bring home a 2nd Place Overall Team honor.